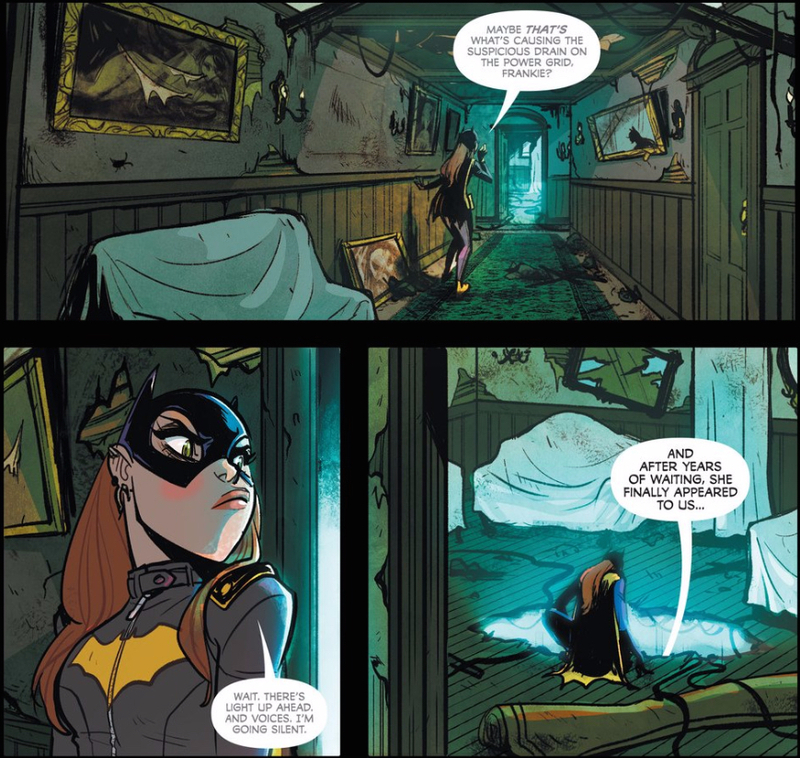 Today, Spencer and Drew are discussing Batgirl 41, originally released June 24th, 2015. Spencer: One of the defining moments of my childhood was watching the Batman: The Animated Series episode “Over the Edge” in its initial broadcast. For any of you who aren’t familiar with the episode, it the one that ends its first act with Batgirl falling from a building to her death, proceeds to Jim Gordon, who feels betrayed that Batman never told him that Batgirl was his daughter Barbara, raiding the Batcave and capturing Alfred, and only gets more insane (and more violent — I never saw the episode reran) from there. The sheer spectacle of the episode captured my young heart, but it also garnered its fair share of detractors for its ending: the whole story was a nightmare of Barbara’s after being gassed by the Scarecrow. The “it’s all a dream” ending never bothered me because, as exhilarating as the action was, the true heart of the story was Barbara’s fear of what would happen if she never told her father she was Batgirl. The conflict over Babs’ identity and Jim’s reaction to it is one I’ve seen rehashed in the comics numerous times since, but with diminishing returns. With Jim Gordon now taking the mantle of Batman, it seems inevitable that Batgirl 41 would again focus on this aspect of Jim and Barbara’s relationship, but I feel like I’ve seen this story a few too many times at this point. So yeah, in case you haven’t been keeping up with recent issues of Batman, Jim Gordon is the new police-sanctioned Batman. He and Batgirl first meet as she’s busting up a cult trying to resurrect Batgirl’s evil cyber-doppleganger (the “Children of Hooq,” a darn clever idea) — Batman tries to arrest Batgirl, and she just barely slips away. The next day Jim visits Barbara at home and reveals to her that he’s the new Batman. To her credit, Barbara immediately tries to confess her own secret, but Jim also cuts her off to explain that he’s been tasked with capturing Gotham’s vigilantes — including Batgirl. I’ll admit that this rubs me the wrong way. Jim and Batman (and his partners) haven’t always seen eye to eye, but Jim obviously respects their work if he’s allowed them to operate in his city for this long, and “Over the Edge” showed how significantly betrayed Jim would need to feel to turn against them. Jim hunting the Bat-Family just because his commanding officers tell him to isn’t consistent with his characterization, but what’s even worse is how nonchalant he is about the whole thing. Jim’s not worried about his relationship with these heroes — just the law and his own safety. Neither of those concerns are wrong, but it flies in the face of the respect Jim is supposed to have for Gotham’s protectors. If he can turn against them this easily, how did he ever allow them to operate in Gotham in the first place? An attack from Livewire forces Batgirl back into action, and again Batman attempts to arrest her. As cliffhangers go, it’s weak — sure, there’s fun in trying to figure out how Barbara’s going to get out of it, but Jim already tried to arrest her earlier in the issue and already told her he was after the Batfamily. The final page lands more with an inevitable “ho hum” than any sort of surprise or impact. I suppose what may undercut this plot the most for me is how little time Barbara has to process it. Between Jim’s reveal and Livewire’s attack there’s only three panels where Babs has any reaction at all, and they’re awfully muted (mainly just confined to facial expressions). Between that and Jim’s strange coldness, what should be an emotional storyline feels awfully perfunctory. This is especially the case when we’ve seen this storyline so many times before! This isn’t even the first time this story’s been told in the New 52 — we spent a significant amount of Gail Simone’s previous Batgirl run on a storyline that put Jim and Batgirl at odds (and again, it took a staggering emotional betrayal on Jim’s end — the supposed death of Jim Jr. at Batgirl’s hands — for the conflict to even start). If Brenden Fletcher and Cameron Stewart are determined to tell this story yet again, it’s going to take a great deal more emotion and inventiveness then they’ve given it so far to make it stand out. Hopefully we’ll see that in upcoming issues. Fortunately, Babs Tarr’s art is just as lively and lovely as ever, but there’s some new wrinkles to it too. Stewart is no longer on layouts, giving Tarr the freedom to arrange the page as she sees fit. Gone are the grids and copious amounts of panels (which were never a bad thing, mind you), and in come some truly dynamic sequences of panels overlapping, fading into each other, and cascading out into action scenes. There also seem to be some slightly offputting changes to Tarr’s process, though. The gutters have doubled in width, panels have lost their borders, and some of the inking and background seem a bit less defined. Likewise, new colorist Serge LaPoint’s colors are generally brighter than Maris Wicks’ were (this is an issue moreso in the printed copy than the digital, but there are places where it feels like I’m squinting to look at these panels through the glare of the sun or a hazy filter). These aren’t necessarily bad changes, and they don’t affect the storytelling, but they are going to take a bit of getting used to, at least for me. Drew! I feel like I’m being a bit harsh on this issue, but it just didn’t work for me as well as Fletcher, Stewart, and Tarr’s Batgirl usually does. Did you get more out of the story than I did — maybe you’re less tired of exploring Jim and Barbara’s identity issues than I am? And what’s your take on Frankie as the new Oracle? I kinda wish they’d just say her name already. Drew: You know, I think every one of your criticisms is valid — Jim is definitely throwing over Batman’s allies to easily, this is a story we’ve seen many times over, and Frankie is pretty obviously the new Oracle — but I somehow made it through two readings of this issue without picking up on any of that. I was hooked into (or should I say hooq-ed into) this story from the start to the end, even when it was feeling a bit silly. I think a big part of that is Tarr’s newfound freedom with the layouts. I should clarify that I absolutely loved Stewart’s layouts in the previous issues, but it’s clear that Tarr makes slightly different choices (mostly more exaggerated angles, proportions, and expressions) without Stewart’s input. If nothing else, there’s a novelty to seeing Batgirl drawn with such cartoonish abandon. That’s several steps more cartoony than even Bruce Timm, but it absolutely works for this series. But, as with everything else Spencer mentioned, those exaggerated gutters do feel a bit odd. I suspect that this issue may have been drawn with comixology’s guided view in mind — there are too many beautiful little screen-sized sequences to be a coincidence — which may explain a narrower field of view. Of course, those narrower layouts only serve to exaggerate the impact of full bleeds, which Tarr only employs towards the end of the issue. Indeed, the use of bleed steadily increases as the situation continues to get out of hand, perhaps representing Barbara’s loss of control. Actually, that those bleeds only begin after Barbara’s talk with her father supports Spencer’s opinion that forcing them into confrontation twice was a bit of a misstep. That is, if that confrontation had only happened at the end of this issue, then everything would have built to that point, but because it happens twice, that crescendo can’t begin until after the first meeting. More importantly, I’m inclined to agree with Spencer’s assessment that the reveal is totally out-of-character for Jim. He’s never been one to tow the company line — he’s often been depicted as a maverick within an overwhelmingly corrupt system — and he has too much trust in Batman to throw it all away. But for me, the real impossible thing to believe is that he made this decision without telling Barbara ahead of time. There’s enough room for interpretation in their relationship to say that he might have made that decision without her input (though I might prefer a take where he does seek her approval), but he would certainly tell her before heading off on his first mission. As he says in the issue, he couldn’t bear the thought of Barbara learning “the hard way” if he was injured, which suggests to me that he would tell her before there was a chance of him ever being injured. But again, I didn’t really notice this on the first couple readings. There’s enough propulsive energy in Tarr’s pencils (to say nothing of Stweart and Fletcher’s dialogue) to make this issue a treat in spite of its many faults. 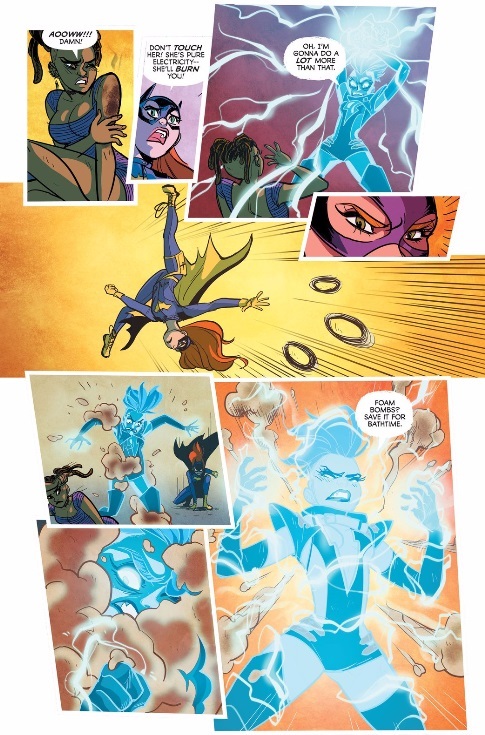 Plus, a Livewire cameo (yet another homage to the Timmverse). You can’t go wrong with that.